Goood morning! How is your week going? Things are hopping around here. Work on the kitchen is moving along. It's exciting. I have been spending my days in the sewing room, not that I'm really all that focused to be honest. 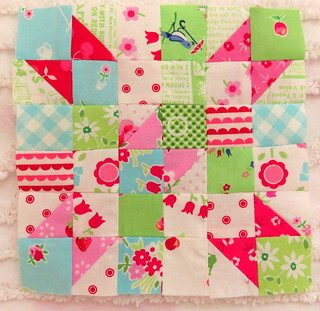 These Splendid Sampler Blocks are just the right size bite of sewing to work on. Not that I have gotten much done. Too much chaos. Its Quiltcon West weekend, so Instagram and Facebook will be filled with pictures from the show, can't wait to see them. So much quilt energy in one place should be a blast. Hi Pam. Good luck on the renovation. We have done our kitchen a number of years ago and it is messy and disruptive. Lots of sewing here finishing up some quilts and making some minis. Believe it or not up until last weekend it has been a nice mild winter here! Hardly any snow to speak of. I can actually see grass right now where last year we had about 8 feet of snow. Now that I've said that, we will probably have a super duper snow storm! I spent the morning watching the IG Quiltcon photo frenzy! I had hoped to go... but here I am at work! I love seeing these little SS blocks too! That block is so pretty.